During the construction of a borehole, strata being penetrated needs transporting to the surface. There are several non-flush drilling methods such as cable percussion or flight auger that will penetrate superficial deposits and clear drilling debris. However other drilling techniques need a flushing medium to carry the drilling debris out of the borehole. When a flushing medium such as air, foam, water or mud is used this medium cleans and cools the bit and transports crushed rock and drilling debris to the surface. In order for this flushing medium to be effective, it needs to be travel at an appropriate speed to transport the drill cuttings. If this speed is not achieved, the flushing system will fail and cuttings will remain in the borehole. If drilling is not stopped at this point, the drilling equipment will become stuck. The speed that cuttings travel up the borehole is known as ‘uphole velocity’. It is usual to use Direct Flush to propel the drilling flush through the borehole. Direct Flush is when a flushing medium is forced through the centre of the drill rods to the drill bit. The flush exits the nozzles/flushing ports of the drill bit at a controlled pressure to suit the strata being penetrated. The flush picks up the strata that has been crushed by the drill bit – known as cuttings and transports them up between the outside of the drill rods and the borehole wall (known as the annulus) and out of the borehole at the surface. The size of the annulus is critical in achieving the uphole velocity needed to carry the cuttings. The bigger the annulus, the greater the flush needed to achieve the minimum uphole velocity. It is possible to use a larger diameter drill rod to narrow the annulus. When a large diameter borehole is being drilled and it is not possible to match the annulus with the flushing system to create the necessary uphole velocity, it is necessary to use a reverse flushing method. This is known as reverse circulation as the flushing system is generally a closed circuit system continuously circulating the mud or water around the borehole. Reverse circulation is where the flushing medium travels down the annulus and up the centre of the drill rods. This system works on large diameter boreholes because the flushing medium travels up the relatively small inside of the drill rods with enough uphole velocity to carry the cuttings to the surface and clear of the borehole. The flush is directed through settling tanks or pits where the drill cuttings fall out. Clean flush then returns into the borehole completing the circulation. Very large diameter boreholes can be constructed using this technique. 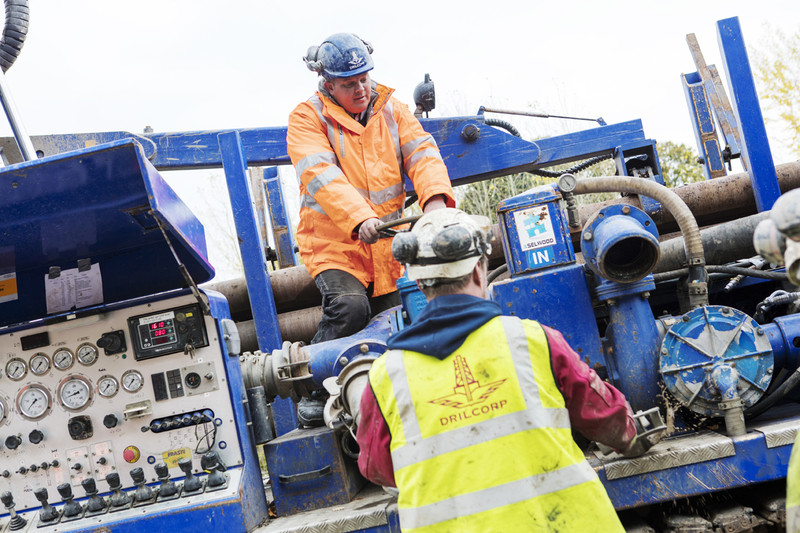 Dave Gowans from Drilcorp commented that “Drilcorp has constructed boreholes up to 1500mm diameter and to a depth in excess of 100mtr using this technique with great success”. Drilcorp has two heavy duty large diameter drilling rigs that have regularly satisfied clients’ needs for large diameter boreholes.